PG vs. VG: What Ratio Should You Choose? PG and VG are propylene glycol and vegetable glycerin, odorless liquids that are mixed with nicotine and flavor additives to make e-juice or e-liquids for vaporizers. PG and VG have different consistencies, and each contributes a different taste to vape juices. PG and VG have different sensations in the mouth and throat, and the two are often combined. The majority of e-liquids combine the two fluids, and their proportions can vastly differ. New vapers and those looking to try new vape juices need to know the correct ratio to get the ideal flavor, vapor thickness, and throat hit. How are PG and VG different? PG is less viscous than VG, so it provides a better throat hit but makes the vapor plumes comparatively less dense. VG has thicker vapor and tastes slightly sweeter than PG, though PG is considered more flavorful than VG. VG is often considered smoother than PG, and some vendors will provide 100% VG mixes for sub-ohm vaping. Now propylene glycol is the most commonly used base for electronic cigarettes. It tends to be very think and runny, which can make it easy to have a mess on your hands. It will also drip faster into the electronic cigarettes wick and atomizer, making you burn through your liquid a little faster than you might otherwise. The thinner liquid does mean that the e-cig is easier to clean though. It won’t gunk up the coil or the inside of the tank as much as the vegetable glycerin, so it makes cleaning a little faster and easier for you. Propylene is also considered a humectant, which means it keeps things moist. That’s a good thing when it comes to the kind of hit it can deliver. It offers a strong, pleasing hit to the back of your throat, much like tobacco does. The propylene on its own offers no taste, so it won’t interfere with the flavors of your liquid. The one thing you have to watch out for with Propylene is that it can cause an allergic reaction. It won’t happen to everyone, but it you have a reaction in your throat from using it, you should stop and switch over to vegetable glycerin right away. The vegetable glycerin is a little thicker and little sweeter. There is a distinctive taste to it that, while slight, will affect the flavoring a little bit. The thickness of it means that it is prone to stick to the sides of the tank and the coil, making it a bit of a pain to clean up. You can use alcohol-dipped swabs to get it off most of the time though. Vegetable glycerin seems to be easier for most people, with very limited instances of allergic reactions being reported. But some people have complained about a phlegm buildup after using the vegetable base. The thicker liquid makes for thicker plumes of smoke, which many people find more pleasant. But this doesn’t make for a more pleasing throat hit, and the thickness of the liquid detracts from the sensations most vapers are looking for. The choice of which one of these to use is really up to personal preference. Most people tend to go for the propylene, which may be why manufacturers have opted to include it as the standard in most e-liquid selections. 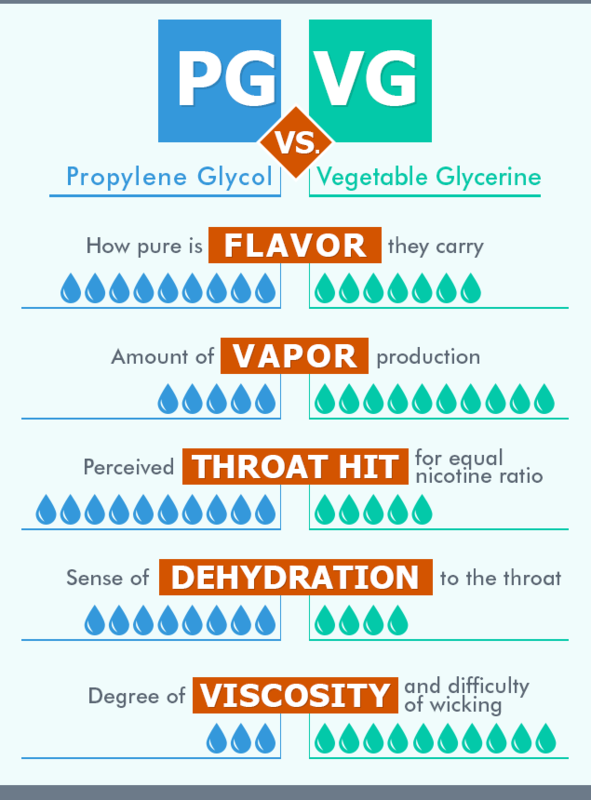 Because vegetable glycerin distorts the flavor, propylene offers a truer experience. The only real advantage the vegetable glycerin has over its counterpart is its thicker plumes. Many vapers love the sensation the thick plumes of smoke provide, and they may miss not getting that experience from the propylene. PG is an ingredient often present in asthma inhalers, pet food, oral or topical medical products, and even beauty products. VG has been used as a sweetener and can be present in beauty products like makeup, mousse, bubble bath, deodorant, and aftershave. It is also found in pet food, hand cream, pills, and toothpaste. Some people say that PG irritates their throat, and in rare cases experience allergic reactions. If you see any rashes or having unpleasant reactions because of PG, it is time to look at VG. The most common side effects of PG are a sore throat, dry mouth, and feeling thirsty. This only lasts for a few days to a week while the body gets used to PG. Liquids that have a high level of VG cause clogging in the coils faster, and keep it from functioning properly. Older models of vaporizers that still use small coils like clearomizers are more prone to VG clogging. The side effects that people commonly experience are dry mouth, increased thirst, and sore throat. Drink plenty of water or stop vaping for a while if needed. It’s not simply a matter of picking a juice with a proportion of PG to VG and hoping that it will be good for you. Your equipment plays a key role in the decision. If the juice is not correct for the setup, your vaping experience won’t be the same, mainly because of issues that will arise with the wick, and throat irritation. Clearomizer – This is the most common style of tank for vaping, such as the Mini Nautilus and Kanger Protank. The length of the coils in these two mods ranges between 1.2 to 2.5 ohms and vapes no more than 15W. Using high VG liquid in these tanks is not recommended. The coils are not able to cope properly with gloopy fluid, which can cause the cotton to burn. A 50/50 VG to PG ratio is ideal for this type of tank. Sub-ohm tanks – This type of tanks include brands like Aspire Atlantis and Kanger Subtank. They are ideal tanks for the powerful sub-ohm vape mods, and are geared to do well with high-VG e-liquids juices. Using high-VG e-juices produces thicker vapor, offers batter taste, and doesn’t consume the juice too quickly. RDA/Drippers – If you choose to utilize a dripper, there is more flexibility on your fluid ratio, which will be dictated by the strength of the coil you use. You will need sub-ohm coils if you want to use a higher-VG mixture. Conversely, you would need high-ohm coils to use a higher-PG juice, though cotton wicking won’t be as hard. As always the ratio is up to you, but dripping tends to be best at a 30% PG, 70% VG mix. How do VG and PG Affect Vape Flavor? Steeping – Steeping takes longer in high VG juice because they’re thick. It can take longer if you’re steeping e-juices based on multi-flavor recipes. On the flipside, some high PG e-juices can be vaped right away without any steeping. Thinning High-VG E-Juices – In case you have made e-juice using a ratio of VG, there might be an issue with wicking gloopy fluid with your coil. Pour in distilled water to your juice, so it thins out a little. This way, the cotton will be more absorbent to the fluid. Nicotine and Flavorings – Most flavor concentrates and nicotine come with a PG base. You need to make an important consideration about this when you are making an e-juice with high VG; if the juice has higher percentages of nicotine and flavor, the level of VG drops even more. You will also find nicotine and flavorings in VG, but this is not yet commonly sold. You might have to experiment with different combinations of the two to find your ideal VG/PG blend. However, remember that the ideal flavor, throat hit and vapor depend on many other factors such as your hardware, the quality of the e-juice, and voltage/wattage setting. You can also check out our best vape juices section to find the right e-liquid brand or flavor. Responding to consumer concerns that two chemicals found in popular e-liquids – diacetyl and acetoin – can be harmful when vaporized and inhaled, vape juice manufacturers have started to remove these compounds from their e-juices. In addition, DIY vape juice makers have also started to create organic vape juice, in the hopes that they can make a suitable, and safer alternative to mass-produced e-liquids. I get extremely bad nose bleeds for about 30 minutes usually at night. I use PG & VG according to the bottle. Dries out my sinuses. I bought the VG/PG For mixing with liquid soap and water to get better foam soap and lubricity. I don’t know what ratio however. I believe your viscosity portion on your chart may be incorrect, or easily misinterpreted by someone not willing to read the full information on your page. You state that VG is a much thicker substance compared to PG just before your chart comparison. At the end of your chart comparison, where ‘Viscosity’ can be read in the orange, you have a high number of tally marks for VG, while there is a fewer amount of PG tally marks. A high viscosity would mean that a liquid is able to move much more freely (lower resistance), compared to a low viscosity meaning that a substance has a higher resistance while trying to move. Example: High Viscosity (water) — Low Viscosity (Engine Oil). I would recommend flip flopping the PG/VG tally marks, as well as adding below it the ‘difficulty of wicking’ as another comparison between the two, by itself. It just caught my attention and had some time to share my thoughts. Otherwise it was a great read! Thank you! That info on viscosity is completely wrong. High viscosity is thick. Oh, good grief — look it up before you write! Viscosity is a measure of the resistance to flow. The more viscous a fluid is, the more thick and gummy it is. Also a side affect I’ve experienced is stiff muscles and stiff joints. Was that from the PG or VG?